On November 1st 866 York was overrun by the Viking ‘Great Heathen Army’ led by the scarily named Ivar the Boneless. Much suffering ensued. York Sports Village was the setting for the 4th race in the National Trophy series. Set in the grounds of a large sports complex and utilising the sloped terrain surrounding an outdoor velodrome similar to Welwyn. Slightly undulating, with lots of turns, sharp climbs on unstable surfaces, a hurdle and some very tricky off cambers, this was a true technician/bike handler’s course. The locals were very accommodating especially as their handsome sculpted landscape was about to be destroyed, albeit temporarily by the invading hordes. They didn’t know what was about to hit them as they found themselves under attack from a convoy of vans spewing men dressed head to toe in waterproofs. In fact if it wasn’t for the accompanying cyclists, one could be forgiven for thinking this was a convention for trawlermen. The reason for all the shiny oilskins was of course rain. Although there hadn’t been an outright downpour, there had been a steady pernicious drizzle for a few days. Jetwashers and spare bikes at the ready, it was going to be a muddy one. Of course there are many types of mud. In contrast to Crawley, which produced thick, heavy mud, hard to ride through and clogging up the bike, the conditions here gave a thinner, grittier and more slippery version. From a pit helper’s perspective, thankfully, the bikes were easier to clean, although still required changing as the grit played havoc with the transmission. The downside was that, with the temperature in single figures and a guaranteed soaking ensured from either rain or thrown up wet mud, keeping warm was going to be an issue. Adam Lightfoot was sole Welwyn representative in the Junior category. He managed a commendable 30th. In the Under 16 girls Ellen Bennett was in trouble on the start line, unable to feel her hands. However she put out a great opening sprint and was 4th at the end of the long stretch of tarmac until she was taken out by someone crashing in front of her. This put her back to about 15th. Doggedly she worked her way back up the field to finish a very muddy 8th. Iona Moir started well but succumbed to the cold later on to finish a respectable 19th. Similarly in the under 14 girls Millie Coleman was shivering on the start line. For the first two laps she was in about 8th or 9th place, until suddenly finding her legs and working her way through the field to finish in 5th. An excellent result for a first year. The under 16 boys saw Joe Kiely and Euan Woodliffe compete. Both got off to flyers. Euan took the inside line in the opening sprint, just avoiding a pile up behind, coming in to first hairpin in 6/7th place. Joe glued himself to eventual winner Finlay Pickering’s wheel as they opened up a gap on the rest of the field. Euan held his position right up till the end where a small slip cost him some seconds and allowed two riders through. He finished 9th as 1st first year. Joe had been unwell beforehand, suffering from a bad cold, and soon found himself dropping to 4th, somehow he managed one last hurrah and retook 3rd to finish on the podium. 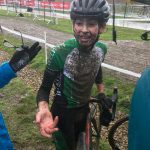 In the U14 race breakthrough ride was from Mark Lightfoot who rode with great skill and power to take his first podium at National Trophy level. Calum Moir and Dylan Starkey were a respectable 23rd and 49th respectively. All rode brilliantly in very testing conditions. Everyone suffered. Afterwards there was a lot of shivering relieved by hot showers. Poor Mark and Joe had to wait for the podium presentations in their soaking wet kit. They were given tin foil blankets to keep warm. During this it was very touching to see the winner Finlay Pickering wrap his own space blanket around Joe, who seemed to be really struggling. Inspiring. Now, just as the Vikings weren’t exactly welcome guests, let’s hope the locals will let us back again after their lovely sports centre was well and truly pillaged, particularly the showers which apparently had more mud in them than the course afterwards. And with that it’s off to Ipswich for National Trophy 5. The Great Heathen Army went there too, but the East Anglians were smart enough to give them tribute in the form of horses, with which they rode off to attack York. Hopefully there will be happy hunting grounds for the Welwyn riders in their own region next time.